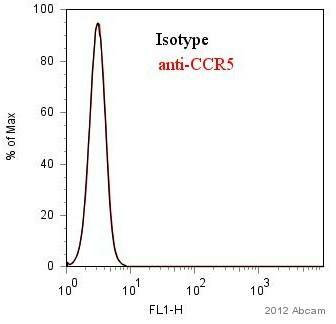 This antibody recognises human CCR5. 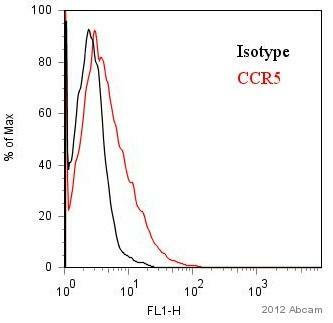 CHO cells transfected with human CCR5. This product should be stored undiluted. Storage in frost-free freezers is not recommended. This product is photosensitive and should be protected from light. Should this product contain a precipitate we recommend microcentrifugation before use. Our Abpromise guarantee covers the use of ab11466 in the following tested applications. Flow Cyt: neat - 1/10. Use 10µl of the suggested working dilution to label 100µl fresh whole blood. 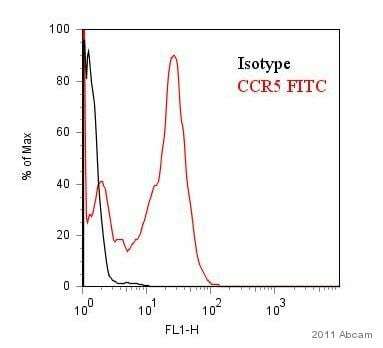 Flow Cytometry - Anti-CCR5 antibody [HEK/1/85a] (FITC) (ab11466)This image is courtesy of an anonymous Abreview. Naive T cells from healthy donor were Th1 derived. The gating strategy used was for alive cells. ab11466 was used at a 1/100 dilution. Flow Cytometry - Anti-CCR5 antibody [HEK/1/85a] (FITC) (ab11466)Image courtesy of an anonymous Abreview. Flow Cytometry analysis of murine splenocytes using ab11466 at a 1/100 dilution. 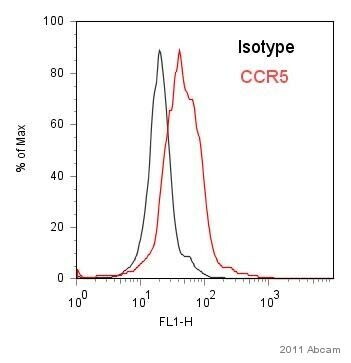 Immunohistochemistry (Frozen sections) - Anti-CCR5 antibody [HEK/1/85a] (FITC) (ab11466)Image courtesy of an anonymous Abreview. ab11466 staining CCR5 in murine spleen tissue by Immunohistochemistry (Frozen sections). Tissue was fixed with acetone, blocked using 5% goat serum for 1 hour at 25°C and then incubated with ab11466 at a 1/100 dilution for 1 hour at 25°C. The secondary used was an Alexa-Fluor 488 conjugated goat anti-rat polyclonal used at a 1/400 dilution. Publishing research using ab11466? Please let us know so that we can cite the reference in this datasheet. Thank you for your inquiry. Unfortunately, I cannot recommend any of these antibodies to your customer. 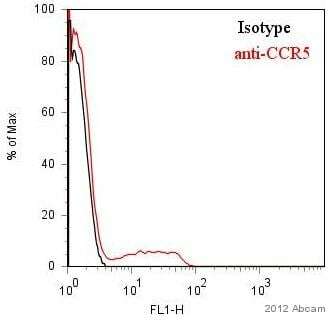 The immunogen for these antibodies was the full-length CCR5 protein. We can suggest that all of them will recognize an epitope in the extracellular domains since they are all suitable for flow cytometry without the need to fix and permeabilise the cells. But to my knowledge the epitopes have not been mapped and we do not know if they bind to the n-terminal part of CCR5. I am sorry I could not provide you and your customer with a positive answer on this occasion. Please do not hesitate to contact me with any further questions.